Last fall, I hosted an event called Bag It - weeks of blog tutorials all designed to encourage handmade as holiday gifts. I'm thrilled to announce that Bag It is returning this fall and it will be bigger and better than before. More tutorials, more ways to participate and plenty of inspiration for your holiday gift making! And look at all the wonderful sponsors who have already lined up to support the event!! 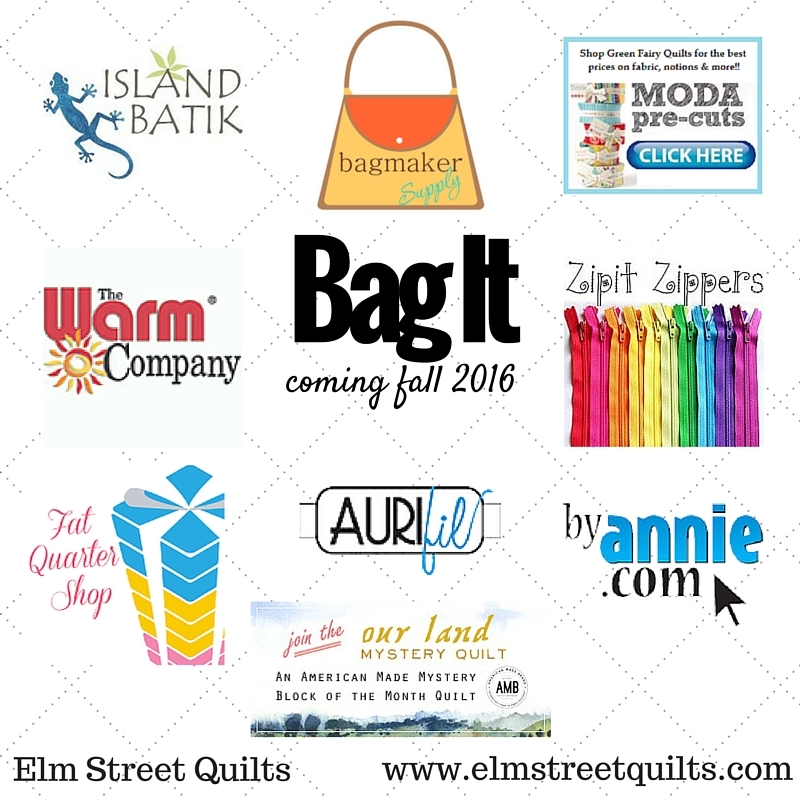 Interested in becoming a sponsor for Bag It 2016? Drop me an email at elmstreetquilts at gmail dot com. Show some sponsor love! - Starting in September, there will be options to earn entries by virtually visiting each of the sponsors. We'll share a bit about the sponsors across several posts so you have plenty of time to visit each one. All those entries go into the overall entry Bag It virtual hat! Make a bag (or 2 or 3 or more!) - Any bag - yes ANY bag - you make during the Bag It event earns you entries into the participant giveaway. There will be plenty of tutorials from Elm Street Quilts to inspire and I'd be thrilled if you made one of those bags. That said, Bag It is all about making gifts for the holidays so any bag you make and share during the season of Bag It earns an entry. Photos of bags can also be emailed to be entered. All those entries from bags you make go into the overall Bag It virtual hat. Share your own bag tutorial from your blog and join the bag tutorial linky. The bag tutorial linky will open soon (more details coming). 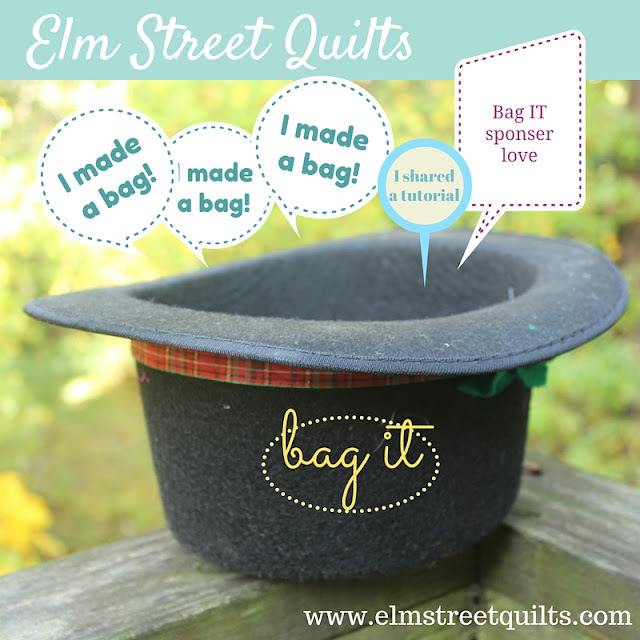 Sharing a bag tutorial - or doing a new blog post that references an existing tutorial and the Bag It event - will also earn entry into the overall Bag It virtual hat! Want to be a featured blogger during Bag It? Drop me an email at elmstreetquilts at gmail dot com. Be the first to hear any news about Bag It by signing up for Bag It specific notifications. 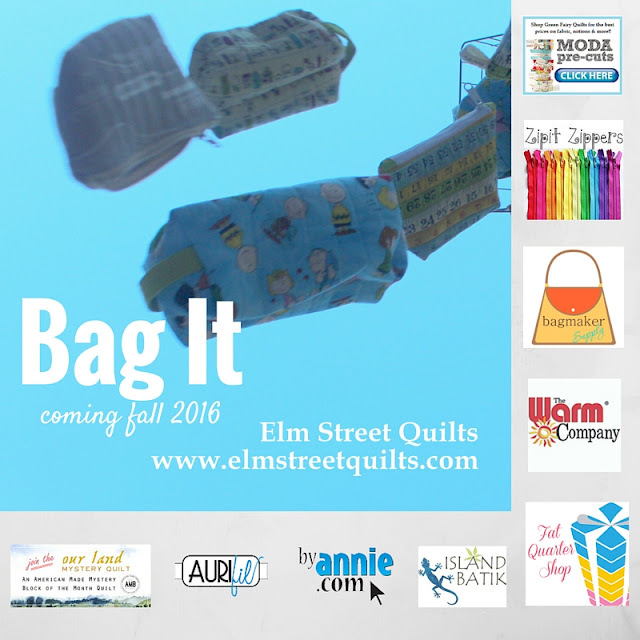 Signing up for the Elm Street Quilts newsletter (see sidebar) and / or joining the Elm Street Quilts Facebook QAL group are other ways to stay informed! Oh Yay!! Love it last year! I really enjoyed Bag It last year. I was traveling and didn't 'participate', but bookmarked some of the tutes and made them later. Am looking forward to learning more! I also loved last year's Bag It! I saved the tutorials, and I've already been making boxy bags this month...some for Christmas gifts and a couple for an upcoming trip to Hawaii. Fun, fun, fun! I made three bags last year, and use them all :) Maybe this year I'll make some gifts ;) Will there be a blog button? I hope to participate this year. Looking forward to this! I had so much fun with this last year and the bag recipients were thrilled. I am excited to see what you have in store for us this year!